You can make money off Fiverr too. In fact, Fiverr has many testimonials of people claiming that their income on this platform has replaced their regular job’s income, and then some. In fact, a lot of people happily announce that they’ve quit their day jobs and are doing voiceovers full time. There’s even one person who travels all over the world and is sustained 100% by his income from Fiverr. That’s how lucrative this micro-freelancing platform can be. But there’s a big warning sign. You have to be careful about using Fiverr the right way. While it’s very easy to get excited about these success stories, and believe me, they resonate on so many levels (Who wouldn’t want to own their time? Who wouldn’t want to work on their own terms? Who wouldn’t want to cherry pick the projects that they get? ), the big problem is, if you don’t know what you’re doing or if you don’t have a strategy, you end up wasting time and, yes, money, in the form of opportunity costs. Think about it, if you are spending your time doing work for people for $10 when it turns out that you could have been working for $50, you are actually losing money. Now, this is different from a situation where you have spare time and you’re simply trying to turn your spare time into spare cash. In that case, this would be okay. This is especially true if you’re training yourself by taking on these jobs so you can level up in the future. 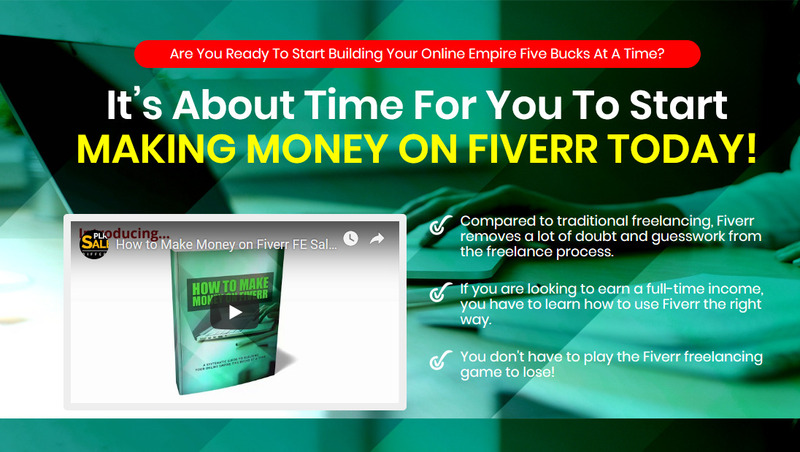 But if you are looking to earn a full-time income, you have to learn how to use Fiverr the right way. 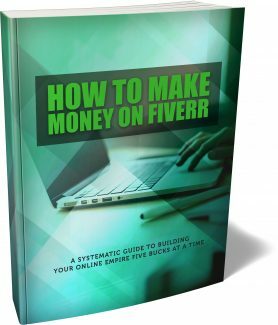 This book teaches you 6 better ways to make money off Fiverr. Make no mistake, offering high value and time-intensive services for $5 is not one of them. By this point, you’re probably excited about Fiverr. In fact, you may be raring to go and put up an ad and see what you can make. Well, you might want to cool your heels for a little bit. How come? Well, here’s the sad reality about Fiverr. Most money on Fiverr is made one way. What way is that? You sell your time for money. You may be thinking, “what’s so bad about this?” Well, if that’s what you wanted to do, you should have just gotten a job. Seriously. You should have just gone to monster.com or some other online jobs platform and hunted yourself down a job. The great thing about a regular job is that you are guaranteed a paycheck every 14 days. You don’t have that assurance with freelancing. Also, most jobs in the United States have a medical and dental insurance plan as well as 401K retirement plan. You don’t have that with freelancing. Keep this in mind. Because if you’re just going to be selling your time for money, maximize your return on effort by getting an actual regular job. Unless your hourly rate is $1,000 or more, it’s just not going to cut it. There’s no comparison if your focus is selling your time for money. What’s the Big Problem with Selling Your Time for Money? There are several problems with this way of making money. First, you only have so much time to sell. Last time I checked, there are only 24 hours in a day. Well, if you’re like most people, you at least need six of those hours to sleep, and probably more. Also, there’s only one of you. It would be great if you have an army of you out there so you can basically farm yourself out to work on all sorts of different freelance projects. You then get paid many times over. But unfortunately, there’s only one of you, with only 24 hours in a day. Traditional freelancing is also not very scalable. Once all your available time slots and production slots are taken up, you have to wait until you clear out some work for you to take on more clients. What do you think will happen if you told them to wait? Based on my experience, at least half of them will look elsewhere. And given how robust the Fiverr platform is, they don’t have to look far, and they don’t have to search long. Another problem with Fiverr freelancing is that it’s too easy to feel that you’re stuck offering one type of service in one particular type of context. It gets old quickly. It seems that all the amazing benefits of Fiverr are simply off limits to you. You quickly discover that it’s basically hard work. Now, you may enjoy what you’re doing, but if you get pigeonholed and you just offer one type of service, let’s say you’re a graphics artist and you design banners for people, your skill set is not growing if that’s all you’re doing. If you’re doing banners all day, every day, the improvements you can make as far as taking your skills to the next level is actually fairly restricted. On top of this, there is always the chance that someone will undercut your pricing. You have to understand that the vast majority of people on Fiverr either do not make any money at all or they make very little money. There are a lot of reasons why this is the case. Some people simply do a bad job and they get bad reviews. Other people charge too much money. You have to remember that the market has expectations based on the services you provide. If the going rate for banner design, for example, is $5 and I come along and put up my service for $25, chances are, I won’t get too many orders. I may get orders every once in a blue moon, but you can bet that they’re not going to be repeat orders. For customers to come back, they must feel that they’re getting a solid value. You can deliver on that value based on quality or price, but the problem is, Fiverr tends to attract people who are drawn primarily by price. I know, it’s rough. We can cry about it, we can definitely whine, but I doubt any of that is going to change the situation. That’s just the way it is. I don’t mean to depress you. I definitely don’t want to discourage you from using this amazing platform. It is amazing. It can make you money. But you have to use it the right way. If you use it the wrong way, it can easily become a race to the bottom. That’s right, when you look at the pricing that you offer, make sure it’s cut to the bone because you can bet that if there is any allowance for a decent profit, somebody will come in and offer a lower price. 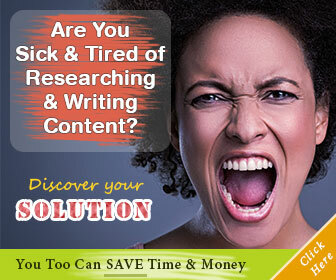 This is especially true when it comes to virtual assistants, data entry, and similar services. It is brutal. We’re talking about people working for less and less money. It used to be that the low cost service providers would come from Southeast Asia as well as South Asia – in places like Bangladesh, Sri Lanka, Pakistan, India, the Philippines and Indonesia. Now, the action has shifted to Africa. If you think people from India were charging low rates, think again.